Many people who are living in the United States may often hear their neighbors encouraging them to vote. They may wonder if they can vote if they are living in the U.S. on a work visa or green card. That's a great question! To vote in a federal election in the United States, you must be a U.S. Citizen, meet the state's residency requirements, and be at least 18 years old. What US Representative District am I in? What TX Representative District am I in? If you're reading this, you're probably in Collin County, but you may wish to double check. What voting precinct am I in? 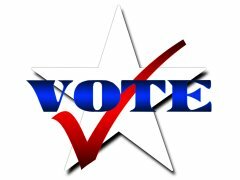 In Collin County you can choose to vote at any of the vote centers within Collin County. To find the vote center or polling location closest to you, click here for an interactive feature provided by the Collin County Elections Office. You can review a list of vote centers or type in your location and find the closest location on the map. It'll even provide directions. Can I Just Show Up and Vote? No, you need to register to vote at least 30 days prior to an election. Click on the link above for more information. Can I register to vote at the poling place? No, not in Texas. You must register 30 days prior to an election to vote. How early must I register to vote? Thirty (30) days prior to an election. An ID is required to vote. Click the link above for a list of acceptable IDs. How do I know what the candidates stand for? How do I know who to vote for? Candidate statements may be found at the above link. There's several features that make this interactive website very helpful: you can compare two candidates side-by-side, and then you can make your selection (which you can change later) and then email or print the information to take with you to the voting booth. Would I be considered a Democrat or Republican? We've provided links to help you to determine to which party you most align. Where do I learn about the judges? There are a few resources where you can learn about the judges. Check the links below. You can do a side-by-side comparison of the profile of judicial candidates, read about sitting judges, learn about the judge races, and read campaign finance reports. What better way to find out about sitting judges than from the attorneys who meet regularly in their courtrooms? From their website: The judiciary committee is the CCBA point of contact with the Judiciary in Collin County. The committee conducts and publishes a judicial preference poll or a judicial evaluation poll depending on election campaign periods. The Dallas Bar Association also publishes a Judicial Evaluation Poll, but while State court judges will be listed here, Collin County judges will not be listed in this poll. It's still a good resource to keep on hand if the Collin County poll has not been updated. I still can't find the information I need, what can I do? Check local media sources, specifically if you find your political views are in line with the media outlet. Caution: You can't let your mind relax and just take the recommendations without reading the reasons for the recommendations, because you may disagree with the bias of the writer. Check websites of special interest groups. Groups such as Texas Right to Life and Texas Alliance for Life are just two such groups. If you agree with their goal, you may find their recommendations helpful. However, this is not always a sure bet. These organization's websites are also helpful if you hold an opposing view with the organization's mission, because you will know the candidates who disagree with you.